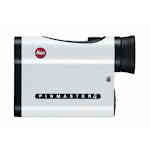 The Leica Pinmaster II is a pocket-sized golf rangefinder with range up to 820 yards. The Pinmaster II is lightweight and stylish, designed for easy one-handed use. It features a durable carbon fiber-reinforced body and is waterproof up to one meter depth. Pinmaster II rangefinders feature Leica's proprietary AquaDura coating so they shed water from the lens, for accurate readings in any weather.